U.N. Secretary-General Antonio Guterres said Tuesday that there has been a "quantum leap" in relations between the world body and the African Union and he hopes this can translate into progress on some of the continent's biggest challenges. "I am totally committed to the cooperation between the African Union and the United Nations," Guterres told VOA in an interview at U.N. headquarters Tuesday before he heads to Addis Ababa for this weekend's AU summit. "We are working more and more together in addressing a number of situations in Africa." He pointed to Tuesday's breakthrough on the Central African Republic — the government and 14 armed groups initialed a deal to end five years of fighting during peace talks in Sudan. "It was led by the African Union with full support of the U.N.," Guterres said. The U.N. has more than 13,000 peacekeepers in the country, which has been wracked by intercommunal and religious fighting since 2013. Other bright spots on the African horizon include September's reconciliation between Ethiopia and Eritrea after two decades of animosity following a dispute over their border. 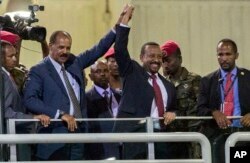 FILE - Eritrean President Isaias Afwerki, second left, and Ethiopia's Prime Minister Abiy Ahmed, center, hold hands as they wave at the crowds in Addis Ababa, Ethiopia, July 15, 2018. Guterres, who was present in Jeddah in September for the signing of the peace deal between the countries, said the reconciliation is having a positive effect throughout the Horn of Africa. "We see negotiations between Djibouti and Eritrea, and we see reconciliation between Eritrea and Somalia that already took place," Guterres said. "We see in many other areas movement in the right direction, and we are totally committed to work together — the African Union and the African subregional organizations — to support this wind of hope." Last month, cooperation between the two faltered, after the Somali federal government expelled Guterres' special envoy for raising the case of Mukhtar Robow, a former al-Shabab leader who has moved into politics and sought to participate in elections in the South West state. 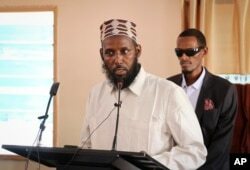 FILE - Mukhtar Robow, once deputy leader of Africa's deadliest Islamic extremist group the al-Shabab, speaks at a press conference about his candidacy for a regional presidency, in Baidoa, Somalia, Oct. 10, 2018. The national electoral commission banned Robow from running, while the South West state electoral body said he could be a candidate. Robow was arrested in December and violent protests ensued both for and against the decision. Guterres recently sent his top political official to Mogadishu for talks with the government. "I will be appointing now very soon a new envoy," Guterres told VOA. "And I hope there will be a new beginning of our relations; that is very important." He said Somalia is making progress, particularly on economic reform, and the U.N. wants to encourage and support that, including through urging international financial institutions to offer their support. In the Democratic Republic of Congo, the country is facing continued instability in its east from armed groups while it is trying to contain an Ebola outbreak that has sickened more than 750 people, 465 of them fatally. Amid this backdrop, the country held presidential elections. The results were disputed and the man many believe came in a distant second was inaugurated as president. But despite this, the country had its first peaceful transfer of power in 60 years. FILE - Democratic Republic of the Congo's outgoing President Joseph Kabila, left, shakes hands with newly inaugurated President Felix Tshisekedi after he was sworn-in in Kinshasa, Jan. 24, 2019. "We consider that what's important now after the elections, with the new government, is to create the conditions for inclusive dialogue among all the parties, and to make sure that we have a transition of power that allows for the country to move ahead and we will be supporting the country to move ahead," the secretary-general said. 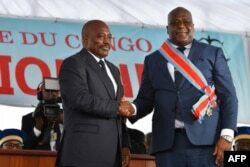 "The DRC is potentially a very rich country, but unfortunately it has been in permanent crisis. I hope that this transition will allow for the country to be able to be moving forward, and to be able also to address the remaining problems." "Our own objective is to make Africa overcome its difficulties, to make Africa a continent of hope, to make Africa a continent of the future, to make Africa a pillar of the world in which we live — not seen as a problem, but seen as an opportunity," he said. DR Congo President Has Officially Won, But Can he Govern?